I have written before about sanitary arrangements. What you have shown to the right is a standard toilet—literally, being an American Standard model—for No2s. The gents’ urinal is much as in the west but generally fitted badly. The one pictured here is within the Main School in the Science labs. 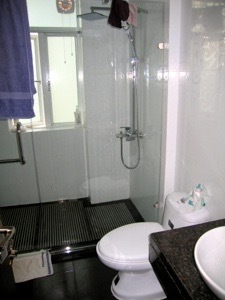 It is unusual in that the flush works and it is very much cleaner than most. 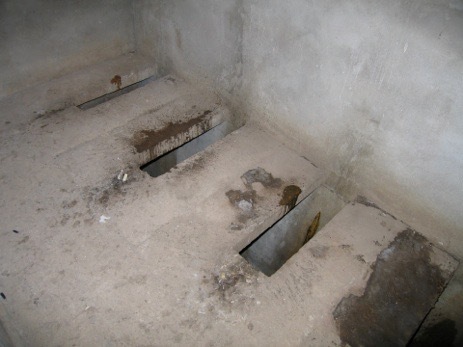 On our third floor the similar construct is sheet steel, but has been laid (not ‘to falls’) so that the urine doesn’t head to the drain. Result then that that corner of the building stinks, even when some nasally aware person uses a bucket to flush the channel. More commonly than not, toilets smell here, irrespective of the time of year. Example of typical urinal from the gents in the science labs again. Discolouration is normal for here. It may be a feature of the lack of chemically-supported cleaning (though suitable chemicals would be in the lab on the floor below. I wrote in the earlier piece that there is a sense in which we should be pleased that China is not polluting the world with cleaning chemicals. The same voice might say it is doing enough polluting already. Western toilets are to be found. 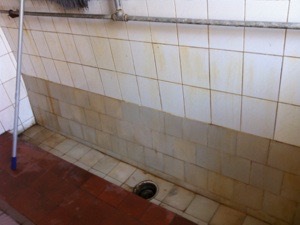 Here’s a nice, clean one from our flat (see essay 46) in ZhaoQing. Below and right is an extreme example found at one of the tourist spots outside Xi’an. The holes are sited over a five metre drop (it looked to be twice that). 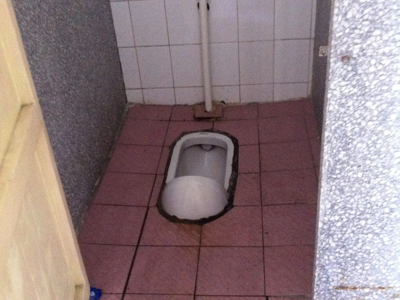 The toilets in school in Xi’an were uniformly disgusting, giving new meaning to the phrase high summer. I’ve written before (Fresh Air 38, the Cleaner 34) about the use of cleaning materials – they are for sale, but somehow frowned upon publicly. I have to say that the flush on the western-style toilets is remarkably quiet. After long years of being aware that, if someone went for bladder relief at night then all in the house were aware it had happened, here one could leave all the doors open and no-one would waken at the noise. I can hope that things have changed in Britain, but I doubt that the rate of replacement is high enough to have made a difference. The life-cycle of a whole building here is shorter than the expected life of a loo in Britain. Other changes of use (found in China and not in Britain) include throwing tea leaves into the bowl; not looking to see if the flush was effective (that adds to the smell factor); accepting that the door doesn’t work; fag ends anywhere; printed exhortations not to put toilet paper into the bowl but into the bin provided (adds to the smell, but far too much paper is used to flush away). Oh, and there’s only very rarely any toilet paper, so you carry some everywhere you go. Well, those with poor bladder control do. 1 I offer that prints on the rim as a new phrase for you to find uses for. How do you know an Chinese student has been to the restroom? Shoe prints on the rim. How do you know an elephant has been to the restroom? You don’t; elephants don’t wear shoes. Two pictures taken from the same toilet in QD town centre. Read them and weep. 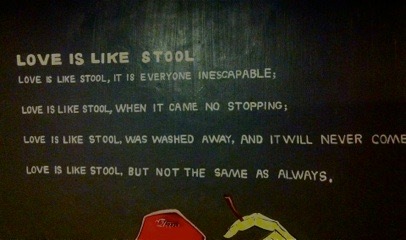 Love is like a stool, but not the same as always. Pee very comfortable, do not forget to wash your hands. Urine is not into the pool, indicating your short. Things always look better when you put them in a circle.